Nov 09, 2018 We appreciate your feedback! We’re so happy to hear your local team was able to figure out a resolution. 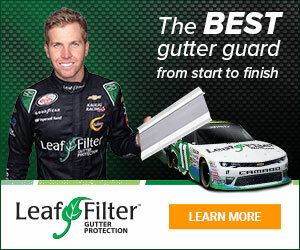 Thank you for recommending LeafFilter and enjoy your clog-free gutters. After several conversations with the local Leaf Filters they came up with a different way which finally solved our problem. I was happy to pay for the labor only. I would recommend Leaf Filters to anyone. We bought Leaf Filter for the front gutters and they are working fine. Our problem is with the rear gutter in our screened pool enclosure. I was told I wouldn't have to get on the roof to clean the gutter. Well when they installed the special screen they installed it on the gutter which is 5 inches below the roof line, then the 6" gutter and then the screen from the enclosure forming a U-Shape. Now the leaves simple fills the "U" making the screen useless since the water isn't able to get into the gutter. We had a tech come out and he cleaned the gutter, his suggestion was to purchase PVC pipe attach it to my shop vac this way I wouldn't have to get on the roof I'd be able to vacuum the leafs from a ladder and simply remove sections of the PVC as I pulled it towards me. I'm 75years old, 100% Disabled. I'm still waiting on an answer to resolve our problem. I purchased this product to resolve a problem and now I have a bigger problem. Product or Service Mentioned: Leaffilter North Gutter Guard Installation. Preferred solution: Give me what the sales rep promised, your the experts. Review #1377069 is a subjective opinion of BrilliantTawny Owl.